In the beginning there were 53 of them. Amid nationwide chaos and destruction, the earliest members of the Communist Party of China (CPC) had the charisma to draw support for their revolutionary cause. But as it turns 90 years old today, the CPC - now a political party with 80 million members, the most anywhere - has long moved on from an embryonic reliance on conviction and charm. And as the ruling party of the world's second-largest economy, the CPC is well aware that one of its founding mandates in 1921 - to "thoroughly break off connection of any kind with bourgeois intellectuals and similar parties" - has become obsolete. Instead, engaging ordinary Chinese as well as the world in a more open, transparent manner has emerged as a necessity. In 2009, the CPC Central Committee proposed to appoint spokesmen and spokeswomen in its provincial and city-level committees. This February, the committee's International Communication Office, which oversees the endeavor, hosted a three-day training seminar for these regional and municipal Party communicators. By now, what the Party calls its "spokesperson system" has been set up in all provincial-level CPC committees on the Chinese mainland and is widely found in their municipal subordinates. Some districts and counties, too, have joined the effort. Communicators for Party committees from central to local levels, who are often senior deputy heads of the departments they represent, have been introduced to the public through news briefings. Most of their office phone numbers are publicly available. Their responsibilities range from explaining the Party's policies to reporting the progress of its projects, promoting its congresses and meetings, offering its stance on important events, and clarifying misconceptions about it in breaking stories, Wang Guoqing, deputy director of the International Communication Office, said in April. The mechanism has "very important implications" for improving the Party's governance, democracy and image, as well as ensuring the people's right to know, participate, express themselves and scrutinize the government, according to Li Changchun, a member of the Standing Committee of the Political Bureau of the CPC Central Committee. "We ought to make the Party's work - including both achievements and the various contradictions, difficulties and problems that are in place - truthfully known to the public," said Zhao Yixin, spokesman for the history research office of the CPC's Jiangsu provincial committee. This latest nationwide push throughout the Party follows a similar effort across government bodies in the wake of a public relations disaster eight years ago. "The Chinese government, which came under fire for its slow dissemination of information and lack of transparency during the SARS outbreak of 2003, has since maintained a more open attitude toward media coverage of major crises and emergencies," Xinhua News Agency said in February. For Li Xiguang, a journalism professor at Tsinghua University, who helped train the country's spokesmen and spokeswomen, domestic media outlets have grown "more and more daring in criticizing the government and local Party organizations" since 2003. Citing other observers, Li wrote in a recent article for the English-language Global Times that "signs of social disintegration" in a polarizing society "could ignite political turmoil" if mishandled. It was against this background that the Central Committee decided to appoint communicators "in an increasingly unfriendly media environment", he wrote. In Jiangsu, the CPC's provincial spokesman, Yao Xiaodong, said it is essential for the Party to "take the initiative, instead of trying to put out fires as they pop up". Goals for setting up the system include boosting the Party's credibility and learning to release information early, sufficiently and truthfully, he said. "The more we show (reporters), the less likely their work will distort facts. It's OK to show a problem or two. Every society has its own problems. The more you try to cover them up, the more problems people will think you have," Yao said. With the aid of journalism professors and journalists, training seminars for Party communicators have been held in many cities. There was no taboo over the content of discussions at these seminars, according to a veteran foreign media correspondent who was invited to speak at recent sessions in Beijing. The source, who asked not to be named, urged the cadres to learn the kinds of events that Western journalists would consider news. "If the officials don't want to speak, then we're left with interviewing (people on) the other side. The story wouldn't be balanced, but it's not our fault. But if we did interview the officials and didn't include what they say in our story, then we're the ones to blame," the source said. Some cadres have always believed "he who talks much, errs much", the source said. For many Party communicators, becoming acquainted with their new role is not easy. In scandal-plagued Fuzhou in Jiangxi province, Party spokesman Li Wei says he is bound by both cadres' fear of media scrutiny and structural constraints. "The leading cadres all know it (the Party system of communicators) is very important, but they still get afraid of things when it's their turn" to speak, Li said. Party communicators, meanwhile, "are trapped by many limitations and cannot fully express themselves", he said. Fuzhou is the site of a series of bloody protests against forced demolition amid rapid urbanization. The most recent incident occurred in late May, when a local resident bombed himself and three others near the city's procuratorate office. As Li tried to coordinate local police and wait for confirmation of the tragedy and publicity guidelines, rumors flew all over the Internet. One widely circulated rumor stated that an official spokesman had said the explosions were a result of "spontaneous combustion" due to rising temperature. Li, in response, said his information office held no news briefing after the incident, and he had never made a public appearance in the capacity of a spokesman. The content of news briefings and access to information are strictly authorized in the wake of emergencies. Most details of investigations into the May incident, Li said, were with the police, who were reluctant to release information. "The extent of authorization for spokespersons is a challenge. Without this settled, spokespersons are but mechanical broadcasters," Li said. "We tend to say too little and wait till we understand the cause and effect of it all. "It'll be too late then." Similar challenges have left many spokesmen and spokeswomen concerned. In Nanjing, Jiangsu's provincial capital, the official communicator systems - for both Party and government - are relatively mature with live broadcasts and online interactions. Former Party and government spokesman Cao Jinsong says the mechanism can do more. It should serve as a platform through which public opinion can be involved in government decision-making and CPC members are able to take part in Party affairs, said Cao, who is deputy chief of the publicity department of the Party's Nanjing municipal committee. 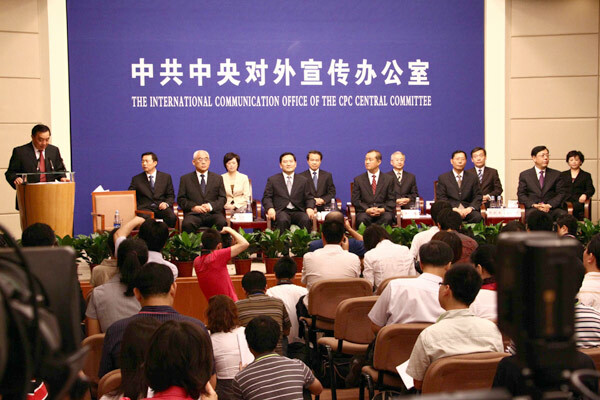 CPC communicators, whose core task is to coordinate the efforts of major players in a program or event, are the channels of information exchange rather than the original news source, he said. "Our job (as Party communicators) is to smooth that channel, and don't get it blocked where we are. No censoring in the name of openness - this is a principle I hold," Cao said. Ultimately, he believes heads of the Party committees that communicators represent should be held accountable in the case of public relations failures. "Spokespersons act on behalf of Party organizations. Everything they say in public is authorized. Spokespersons should be taken to task if they said what they weren't allowed to say. But if they couldn't respond to what the public needed to know, then the top leaders of those committees must be held accountable, because they were the ones who didn't let (the communicators) tell," Cao said. "In a way, the media and public's view of a (CPC) spokesperson reflects their view of the Party itself," he said. Party communicators in China's prosperous coastal regions are, for the most part, well trained and boast some level of media expertise. Yao, Jiangsu's Party spokesman, is a former reporter who received training at the Harvard Kennedy School, where he submitted a 28-page paper - in English - titled "How to Tell China's Stories to the World". Si Jinquan, spokesman for the Party's provincial publicity department, spent 15 years working with news media at the Central Government's Liaison Office in Hong Kong. Cao, in Nanjing, was dean of a journalism institute and has written two books on government public relations. But not all localities are blessed with veteran media handlers. In Wuxing, a district of Huzhou city in Zhejiang province, Party spokesman Mei Feng warns of a lurking risk. "The spokespersons' quality is a foremost issue. On top of that, cadres may be excited (about the job) in the first year. But they'll grow bored in the second or third year, when the spokesperson job becomes an additional burden. This is something we should look into," Mei said. The governance mindset in some areas, too, needs to be improved, said Li in Fuzhou. "The government is the handler of emergencies, not the directly involved party. But in many occasions, official press releases more or less carry a tone of passing the buck. This puts the government in a bad spot," he said. Moreover, the intertwined nature of Party and government affairs at the municipal, county and township levels blurs boundaries between Party and government communicators, Cao said. In principle, Party communicators focus on macroscopic topics and decision-making processes, whereas their government counterparts pay more attention to microscopic issues with an emphasis on implementation. This has made the former's work appear dull, Cao said. The opening of Party affairs is aimed at improving the CPC's work through increasing supervision, which in turn requires making publicly available people's "responsibilities, tasks and progress" of Party affairs, he said. Grassroots CPC committees have grown accustomed to soliciting public opinion prior to the appointments of cadres in recent years. But in Fuzhou, where tension is rife, anonymous informants can be extreme in the way they complain of the lack of transparency. These informants themselves are often the losers in these appointments, according to an inside source. "Since the explosions in May, many informants who gave tips on corrupt yet promoted officials have threatened to bomb the government if their tips weren't dealt with," said a member of the local Party committee's unit that monitors cadres' performance. Li, the CPC's local spokesman, said the "often secretive" Party personnel changes, rewards and punishments could become components of briefings in the long run. "The public and cadres are deeply concerned about these (personnel changes), which weren't so transparent in the past. In the future, they should be allowed to be told in Party press briefings," he said.